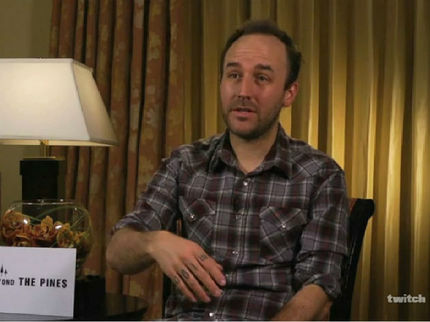 I first had the pleasure of meeting Derek Cianfrance at Sundance 2010, where he premiered his feature debut Blue Valentine, a heart-wrenching and poignant look at the beginning and end of love featuring milestone performances by Ryan Gosling and Michelle Williams. A casual conversation about the film at a Park City-area Starbucks (yes, the one where Tarantino infamously punched a paparazzi) turned into an hour-long discussion as emotionally raw as its subject matter. Now Cianfrance returns with The Place Beyond the Pines, a triptych saga finely woven with themes of regret, redemption, and the choices we make echoing through generations. The film also rejoins Cianfrance and Gosling, a pair of cinematic twins in director/actor form if ever there were a duo. Cianfrance and I also got to return to our conversation that we began some three years ago, this time switching the focus to his new film; what inspired this very personal and abstract way of story-telling, what inspired Ryan Gosling to get a face tattoo for his character, and their shared fantasies of robbing a bank and how that influenced the fate of the film. The Place Beyond the Pines is now playing in limited release in the U.S. Check the official site for more information. Mendo travels to THE PLACE BEYOND THE PINES!